Why are so many people fond of fondue? My husband and I have heard about it and were curious. We never did it before, but heard how good it was, especially from other couples who did it. So we thought we’d give it a try, even though we felt out of our element and didn’t really know how to do it. Hopefully, our inexperience wouldn’t embarrass us. You know what I’m talking about, don’t you? The “it” is fondue. When it first became popular in the U.S. during the 1960s, fondue was one of those cool “to do” things, and for reasons that completely elude me, it’s resurfaced in restaurants and private get-togethers across the country. I’ve heard about a particular fondue restaurant in our local area and wanted to try it to see what all the oohing and aahing was about. I somehow fail to understand, though, the fascination people have with cooking their own food in a little pot at their table, not knowing whether their food is actually cooked (the lighting was too dim to tell), and paying through the nose (even with a Groupon) for the experience, which lasted about 2 hours. Perhaps some people want to feel a kinship with the hunter gatherers of ages past, hunting for runaway food in a fondue pot? Speaking for myself, I felt like I was conducting a search and rescue operation with my fondue forks spearing unsuccessfully for pieces of meat caught in the undertow of the bubbling broth. In my opinion, I’m assuming people want to justify paying an arm and a leg for dipping small chunks of bread, apple, meat, and pastry into cheese, broth, or chocolate. If it costs a bit, it has to be good, of course. I’m open-minded and love trying all kinds of foods as long as they’re not too weird (don’t expect me to eat fried tarantulas like Andrew Zimmern). Although the fondue experience was a disappointment for me and my husband, we were glad to find out what it’s all about so we don’t feel like we’re missing out on something that’s worth our while. 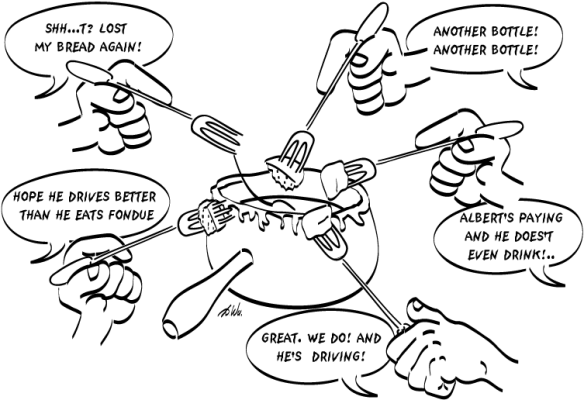 I still, however, continue to ponder the question: why is there so much hoopla around fondue? Why do Americans bother with Thanksgiving? The American holiday of Thanksgiving is about to take place, one which began with the pilgrims and Indians sharing a feast to give thanks for a good harvest. As time progressed and we moved away from an agrarian-based economy, the holiday became a day of giving thanks for the blessings in our lives and spending time with our families. 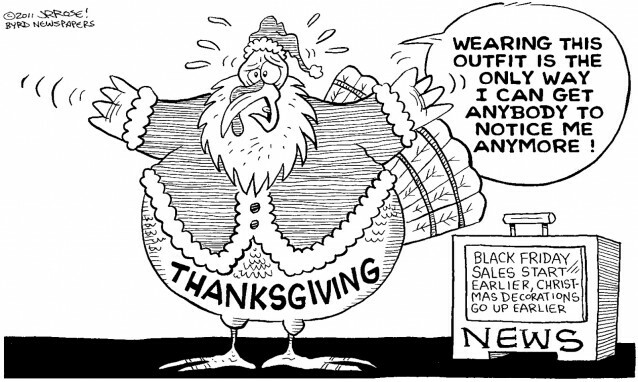 And now Thanksgiving has evolved yet again–it’s become more of a “shopping holiday” with people abandoning the family dinner table and rushing to the stores to buy things for Christmas, because after all, the holidays are all about materialism, right? For the longest time, Thanksgiving once supplanted Christmas as my personal favorite holiday since it was the only one that wasn’t commercialized. Christmas was all about presents, Valentine’s Day about chocolate and flowers, and the Fourth of July about fireworks. Thanksgiving, though, encapsulated for me what the holidays should really be about–spending time with family and friends, enjoying a good meal, and reflecting on positive things. As a kid, I always thought it was crazy for people to line up outside of stores for Christmas sales starting at 6 a.m. Then it got moved up to 4 a.m. Then 3 a.m. I and my family thought the stores were really pushing it when they started opening at midnight on Thanksgiving night, but this year Macy’s and JCPenney will be open at 8 p.m. on Thursday while many Wal-Mart stores will be open 24 hours. What happened to Thanksgiving? Have we become so greedy as a society to sacrifice one holiday for the sake of another? (And we Americans have so precious little time off to begin with.) What is more important–going to the store to buy something for our loved ones or actually spending quality time with them? And what about those store employees who no longer have Thanksgiving Day off? Keep in mind that what goes around comes around. Don’t be surprised if one day Thanksgiving becomes another holiday like Columbus Day and Veterans Day that everyone knows about but nobody has. Why can’t we all just boycott the stores on Thanksgiving and go back to the basics of family and turkey? Why are motor vehicle bureaus located in the seediest parts of town? After getting married not too long ago, I’m going through the oh-so-fun process of changing my last name to my husband’s name. Social Security, banks, credit cards, doctors’ offices, etc., etc. 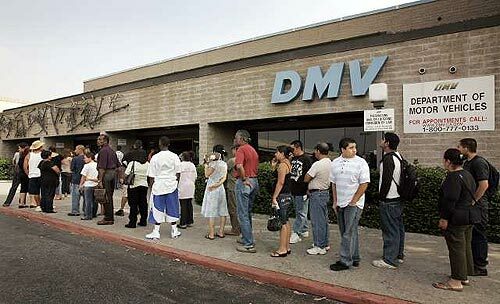 While I was waiting in line to update the name on my driver’s license, it struck me that no matter which state I’ve lived in, motor vehicle bureaus tend to be located in the worst parts of town where all the dregs of humanity congregate. Sometimes they’re in old shopping malls, indoor or outdoor, long discarded for their intended purpose. Sometimes they’re on the other side of the tracks, quite literally. One motor vehicle bureau I visited in Pennsylvania was located right next to a set of noisy, active railroad tracks. Sometimes they’re in once prosperous industrial areas that have fallen to decay and nature. The common denominator, though, among all the bureaus I visited is that they’re all in rundown sections that you normally (and hopefully) have no business being in other than taking care of issues related to your driver’s license. If you ask me, government agencies like the motor vehicle bureau are probably situated in the worst parts of town because money that could be applied to higher rents in better, safer parts are being designated for government waste, such as testing the rate of ketchup flow (I kid you not). It should come as no surprise that the government wastes a heck of a lot of our hard-earned tax payer dollars and gives us few things that can actually be of use. Rather than fund wars we have no business meddling in, the government should do something more productive and worthwhile, such as establishing better (and cleaner) offices in better environments. Somehow I have a hard time picturing people like Donald Trump and Julia Roberts going quite literally to the wrong side of the tracks just to renew their driver’s license. Or could it be that there are secret motor vehicle bureaus accessible only to the super-rich or super-famous hidden in the decent parts of town? Think about it. When was the last time you’ve heard about some celebrity waiting in a dumpy government office for their driver’s license? What I’d like to know is why can’t the government simply get its act together and put our money to actual good use?